“I was so ready to get home after my stay in rehab for a heart attack. Prior to release I was doing really well and my energy was up. When I came home, my routine and the stairs wiped me out. Live In Place checked my whole house and made recommendations. The changes they made have helped me return to the activities I love and to stay in my home.” – Bernie C.
Now how do I preserve my daily routine? And how can I make my surroundings safe and accessible, so I can continue to lead an independent life in my own home? 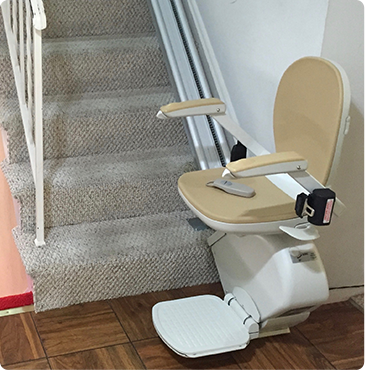 Should I consider a stair lift or railings to my bedroom or laundry? Those who are dealing with cardiac and respiratory issues – which bring on body weakness and fatigue – often ask about these unique challenges in the home. The ability to use longer stairways and to perform basic tasks are but two examples. Live In Place understands that quite often when someone is diagnosed, their home must be looked at in a much different way. Often, simple modifications can overcome perceived limitations and enhance independence and quality of life. We observe and listen and identify your challenges. We pay careful attention to your needs and desires. We demonstrate which specific home modifications will improve your ability to function. We then offer solutions that work for you and your home. Further, we then educate on ways to move and function in your modified environment. We also explain to our clients important principles regarding energy conservation, work simplification, good body mechanics, and – always – fall prevention. Basic rule: When fatigue occurs, falls happen. Live In Place helps put measures in place to prevent falls and also offset the challenges of fatigue. Contact Live In Place today. Let’s discuss your family’s circumstances and challenges. Call (703) 433-0380 or request a consultation.